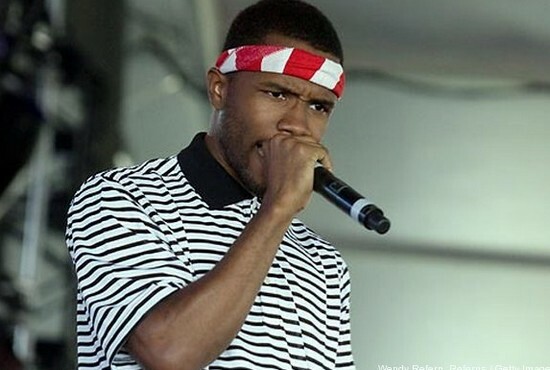 Frank Ocean is a singer, rapper, songwriter, record producer and photographer. He was born Christopher Edwin Breaux on October 28, 1987 in Long Beach, California. His parents Calvin Edward Cooksey and Katonya Breaux, moved the family to New Orleans, Louisiana when he was five years old. His father left the family shortly after the move. Christopher developed a love for music early in his life and performed odd jobs in his neighborhood (including washing cars, cutting grass, or walking dogs) to pay for studio time in his teenage years. He later admitted to selling drugs to fellow students while attending John Ehret High School in New Orleans. Breaux graduated in 2004 and enrolled in the University of New Orleans in 2005 to study music, but when Hurricane Katrina destroyed major areas of the campus, he transferred to the University of Louisiana, Lafayette. Breaux chose not to continue his academic career after recording a few demos with friends who landed him a songwriting deal. He wrote songs for Brandy, Justin Bieber, John Legend, and Beyoncé. In 2009, he joined the Los Angeles-based hip-hopcollective, Odd Future, which led to a signing a contract with Def Jam recordings later the same year. Inspired by the 1960’s film Ocean’s 11, Breaux legally changed his name to Christopher Francis William Ocean in 2010. Ocean self-released his mixtape Nostalgia, Ultra on February 18, 2011 after Def Jam refused to release it under their label. The debut was a smash hit, sending Ocean quickly to the top of the charts and improving his relationship with Def Jam. It also led to collaborations with rappers Jay-Z and Kanye West. Ocean released his first studio album, Channel Orange, in 2012. The album debuted at number two on the Billboard 200 chart and also earned Ocean six Grammy nominations. Later in 2012 Ocean published an open letter on his Tumblr blog, thanking a young man he had an encounter with and thus publicly coming out as a bisexual man. Many of his early lyrics were later revealed to be a dedication to his first love. Ocean has performed at numerous events including Late Night with Jimmy Kimmel (2011), the 2012 MTV Video Music Awards, Coachella and Lollapalooza (2012), and Wireless Festival (2013) . He was named Person of the Year for 2013 by the Webby Awards. For the next three years, Ocean worked on various projects with other artists, while crafting his second album. In August of 2016, Ocean released “Endless,” a single on the album Blonde, his last project with Def Jam recordings. In October 2017, Ocean published a 360-page photo essay magazine titled Boys Don’t Cry. Ocean most recently attended the 2017 Metropolitan Opera Gala as a special photographer for Vogue magazine. Andy Kellman, “Frank Ocean Biography,” Allmusic.com, https://www.allmusic.com/artist/frank-ocean-mn0002592086/biography; Yoh Phillips, “A Brief History of Frank Ocean, Master Rapper,” DjBooth.net, January 2017, https://djbooth.net/features/2017-01-31-frank-ocean-rapping-history; Roisin O'Conner, “Frank Ocean drops new song 'Chanel' -his first solo music since Blonde and Endless,” Independent.co.uk, March 2017 https://www.independent.co.uk/arts-entertainment/music/news/frank-ocean-chanel-new-music-beats-1-show-stream-blonde-endless-albums-a7624291.html. Andy Kellman, “Frank Ocean Biography,” Allmusic.com, https://www.allmusic.com/artist/frank-ocean-mn0002592086/biography; Yoh Phillips, “A Brief History of Frank Ocean, Master Rapper,” DjBooth.net, January 2017, https://djbooth.net/features/2017-01-31-frank-ocean-rapping-history; Roisin O’Conner, “Frank Ocean drops new song ‘Chanel’ -his first solo music since Blonde and Endless,” Independent.co.uk, March 2017 https://www.independent.co.uk/arts-entertainment/music/news/frank-ocean-chanel-new-music-beats-1-show-stream-blonde-endless-albums-a7624291.html.